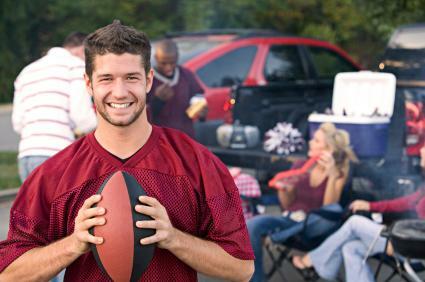 Throwing a football party is a fun way to start the season, or to break the ice with new co-workers or neighbors. These ideas will help you throw a great party that will be the envy of your friends. Football parties are casual enough that you can feel comfortable sending email or other free invitations. Be sure to call everyone a couple of days before the big game to remind them. Your decorating skills are not as much the focus of your football party as they would be if you were throwing a formal anniversary party. Therefore, you can keep decorations easy and casual. If all of your guests will be rooting for the same team, cover a few pillows in team jerseys. Fold the bottoms of the jerseys up behind the pillows and tie the sleeves together for instant team décor. Twist long strands of crepe paper streamers in team colors together and use push pins to anchor the tops to ceilings and door frames. This is best done with help from a friend. Fill several balloons in team colors (from both teams, if you have guests on both sides of the fence) with helium, and float them above the food table. Use short streamers rather than longer ones, so they don't fall into the food. Have every spare seat in the house at the ready; kids' bean bag chairs, folding chairs, and floor pillows. You never know who might show up with an unannounced friend or two in tow. Arrange sofas and chairs in front of the television, even if the arrangement does not suit your usual floor plan. No one will be basking in front of the fire when the game is in full swing. Move everything off of the coffee and end tables, because that is where guests will inevitably want to place munchies. Throwing a football party is all about the food. Well, it's a little bit about football, but if the game is a flop, great food and beverages are all you have to keep your guests happy. To relieve some of your entertaining stress, accept all guests' offers to bring food. Plan to have at least fifty percent more food than you expect to need so that no one has to run to the store during the game. Freeze leftovers, send them home with guests or to your local fire department. Stick to finger foods, at least during the game. Keep the menu as healthy as possible, with plenty of veggies and healthy sandwiches on whole-grain bread. Have cold, bottled or filtered water on hand. Some of your guests may be non-football fans. Those guests will appreciate your thoughtfulness when you take the time to create a quiet conversation area away from yelling football fanatics. Make sure there are toys and games available for children in a separate play area. Play it smart and invite the neighbors if possible. This should help avoid noise and parking complaints. If parking is an issue in your neighborhood, include instructions and a map on your invitations for where to park or arrange for guests to carpool. Have a football on hand for a street game while your guests are waiting for the hot food-or waiting for alcohol to wear off before driving home. Urge all of your guests to get outside or to run around in the basement with a foam football if the weather is too cold or stormy. Give the kids some adult attention and help break the ice for any guests who don't yet know each other. Throwing a football party often includes beer and other alcoholic beverages. If you don't provide it, guests may bring their own. Consider buying a personal breath analyzer and be prepared to insist on driving any guests home or hosting a sleepover for those who are not fit to drive. You may be held legally and financially responsible if one of your guests causes an accident after leaving your party in an intoxicated state, not to mention the effect of such an unfortunate event on your conscience. After the party, bask in the post-party accolades that every great host enjoys. Remember to thank any guests who helped with the party, and start preparing for the next big game.